Do you remember the excitement of getting the Wish Book in the mail? To me, that event marked the beginning of the Christmas season. My brother and I would pore over the pages, marking the things we wanted. One of my most fervent wishes was to receive a full-on cowgirl outfit, so those pages of the Wish Book were always well worn by the time Christmas rolled around. Aren’t these outfits great? Playing the game I played as a kid, I would have wanted either the boy outfit with the rearing horses on the chaps, or the red girl outfit. Roy Rogers was such a huge influence on me–and everyone else, it seems–back in the day. I didn’t know anyone who tucked their pants into their boots back then, but Roy carries it off well. And, now that I have fancy boots, I’ve been known to do the same! I always thought that boys got the best western clothing. Look at the cool fringe jacket hidden in the lower corner. One thing that I really like is the fake boot tops in the lower left of the picture above. What a great way to handle not needing or being able to buy cowboy boots. I was one of the lucky ones in that regard. While growing up, I had four pairs of shoes for the year–school shoes, dress shoes, sneakers and…yes…cowboy boots. But if I hadn’t had cowboy boots, I would have had the tops to make my school shoes into cowboy boots. Oh my goodness! Leopard print cowboy wear! Does it get any better than that? Okay–I can’t help myself. I still want a full-on 1950s cowgirl outfit. I wonder if I have time to shoot off a quick letter to Santa? Now the give away part! I’m giving away a $10 Amazon gift certificate, that you can put toward a cowboy outfit or something else of your choosing. Just leave a comment to be entered. The winner will be announced in the comments on Wednesday, so check back tomorrow afternoon. One caveat–I am going to the dentist today, so my replies will be a little late, but I’m excited to check in with everyone. I hope everyone has a Merry Christmas and a Blessed New Year! You are so welcome, Becca! This post sure brought back some fun memories. Not only did I love Roy Rogers I wanted to be Dale Evans lol Thanks for the post. Happy Holidays. I wanted to be Dale, too, Carol! I wish you could come and see my Roy Roger collection I have. I loved looking through the wish book as a little girl and I too wanted all the western & horse ideas I came across. Thank you for an amazing blog. Merry Christmas to you & your family. Long live the king of the cowboys! 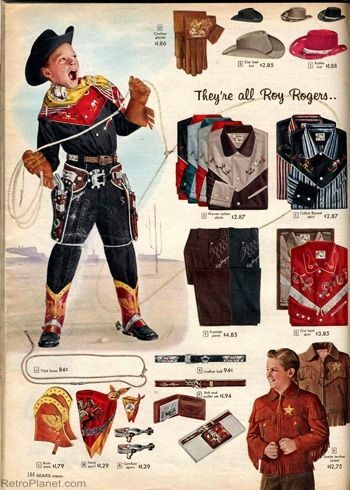 A Roy Rogers collection! That is so cool and I really wish I could see it. ! I once had an autographed photo, but it’s been gone for a long, long time! Oh I loved getting the new Christmas catalogs in the mail and marking everything I wanted! I guess I thought I was extra good, deserved almost everything and my parents were extremely wealthy because I always got very very carried away. Like you I went over the catalog many, many times and I for one always found more things to mark! Going overboard was part of the Wish Book process, I think. I’m smiling just thinking about it. Oh I loved getting the new Christmas catalogs in the mail and marking everything I wanted! I guess I thought I was extra good, deserved almost everything and my parents were extremely wealthy because I always got very very carried away. Like you I went over the catalog many, many times and I for one always found more things to mark! Merry Christmas to you and yours! I loved getting the catalog in the mail. I never got a cowgirl outfit. There are some that are mighty cute. thanks for the memories. You are so welcome, Debra! This is a fun post. I would have wanted one of those leopard print cowgirl outfits if I were still a kid. I always make my husband circle things in his Summit Racing catalog so I know what to get him for Christmas or birthdays. This year he circled a bunch of t-shirts, so I picked out a few. When I was a kid, my sisters and I got to make wish lists, but it was rare we would get anything from the list. Most years I wanted a Barbie really bad, but I always got the knock off Barbie and it just wasn’t the same. I hear you on the knock-off Barbie, Janine. I remember when I got my first official one, it was a gift from a relative and I was walking on air! And I agree on the leopard cowgirl outfit. That one is fun. I remember the christmas wish books from the 60’s I never did get what I really want but close enough. I was a close-enough kid, too, Kim. But my circles gave my mom lots of ideas. I loved getting the Christmas wish books. I couldn’t wait to page through them. The anticipation was wonderful, wasn’t it? Talk about a walk down memory lane! Thank you! I had a Roy Rogers sweatshirt and was in love with it! My favorite shows included Roy Rogers and Dale Evans, Rin Tin Tin, Sky King, Fury, the Lone Ranger, oh my, I could go on. Merry Christmas and thanks for writing such a meaningful blog. Loved reading it. We watched all the same shows, Kathy! Saturdays were the best days ever. I’d forgotten Fury, but what a wonderful show for a horse crazy kid such as myself. Thank you for the trip down memory lane! Hope everything goes well at the dentist. I never saw these as a girl. I did see Roy Rodgers and Dale Evans though. My mom used to get her hair cut with Dale. I love the girls blue skirt and top on the last page. Oh goodness, I would have been like you. Pouring over them constantly. When dressing up, I loved wearing dresses. On the farm, we were in 4-H and one of my interests was horses. As a group we once all tucked in our pants into our boots. The leader was not so happy about it and asked us to all undo them and wear them properly. LOL What she didn’t know didn’t hurt her. My three brothers and I would tuck our pants into our boots on the farm all the time. Hope you have a wonderful Christmas. Love the pant tucking stories, Lori! I was a 4-Her, too. Your mom got her hair cut with Dale? I am so jealous! I must be older, because the cowboy craze never hit me. Can’t remember any of my friends wanting cowboy clothing either. We did get wish books in the mail, but knew our gifts were going to be homemade by our Dad. I love thinking about your Dad making the gifts. That might have to go into a story. Super fun post, Jeannie! The pictures were classic–and the prices! Oh, my goodness!! Thank you, Pam! Merry Christmas to you, too! Jeannie, I do remember these. 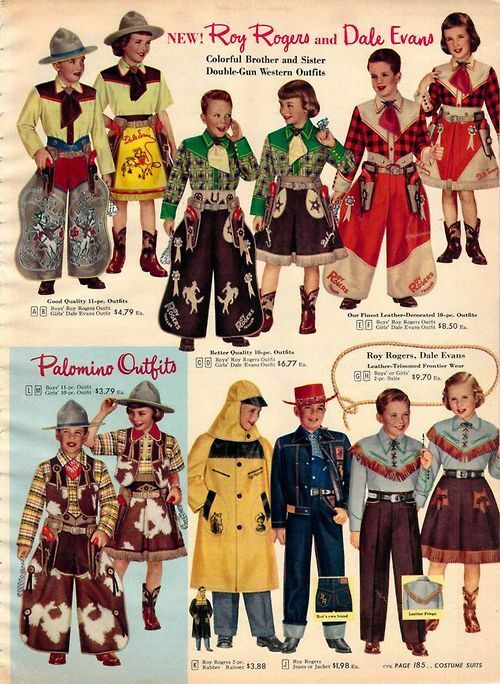 Nearly every kid wanted to dress in these cool clothes and pretend to be Roy Rogers! And I’m stunned by the prices. Good heavens! Those prices are something, Linda. I wonder how much of a weekly budget a $4.95 outfit would have been? Now I may have to do some ciphering. One of my favorite memories was the day the Christmas catalogs came in the mail. I would quickly turn to the toys, specifically, the baby dolls. Thank you for sharing your post and the memories. You are welcome, Melanie. The dolls pages were pretty worn in my wish book, too. Oh yes I do remember the wish book and us wearing the pages out looking at it. As far as boys go they always had the neatest things in the books. I never was much of a girly girl. I had my Barbie’s and things but still liked playing cowboys and Indians. You sure brought back old memories. I agree that the boys often had the neatest stuff. I always liked boy stuff, but I loved my Barbies, too. I did wonder about riding in a dress, even though I wanted the cowgirl outfit. Oh my goodness, aren’t those pictures great!! Haha, I remember waiting for the Christmas catalogs and just spending hours looking through them. These outfits would have been on my list for sure. I love those pictures, so much. I was thrilled when I found them to share. Thank you for sharing this fun post. My brothers and I always looked forward to getting the Wish Book in the mail too and we’d go through the book and circle all the items we wanted. I also watched Roy Rogers and Gene Autry on T.V. I loved watching all Western movies and still do. Merry Christmas and Happy New Year to you and your family. Thank you, Theresa! Merry Christmas to you and yours! I’m still a western movie fan, myself! I always wanted to be a cowgirl and have my own horse. I never got the whole outfit but I had a hat and boots and loved them. I must say I have not out grown my dream I hope to retire and be a cowgirl. I hope you get to retire and become a cowgirl, too, Vicki! What an excellent goal! No, I never had a cowgirl outfit but I was a big fan of Annie Oakley and I would have loved it. I also wanted Mouse Ears because Annette wore them on the original Micky Mouse Club but I never got them either! And yes, wish books were so special to my brother and me! Thanks for sharing this fun post! Merry Christmas!! I didn’t get the television channel that Annie Oakley was on, so I didn’t get to watch her, but I did get an Annie Oakley book with her picture from the show on the front. I liked it a lot. Oh what a lovely post, Jeannie. Thank you so much. I remember having a cowboy hat (like the ones on the bottom page with a twisted line around the outside of the brim) and a gun (and maybe a vest–I’m not sure) and being just so very proud. The show was on from 1951-57, so I’m really surprised I remember so much, like Nellybelle the jeep and Bullet the wonder dog even more than the people or the stories, although I do also remember Andy Devine’s raspy voice and old Gabby Hayes. Merry Christmas, Jeannie, to you and your family. Now you have brought back memories with Nellie Belle and Bullet. My goodness but those were good times watching Roy and the gang! Merry Christmas, Eliza! Boy does this post bring back memories! I remember those days when the wish books came, marking up everything we wanted, then the painful look on our mother’s face when we happily handed her said books, faces beaming! Ah, those were the days! Come to think of it, she often had a drink after we handed her those things! That is so funny, Kit. Everything seemed possible with a wish book. I have never heard of the wish books but I was a great fan of the show. I would watch Roy Rogers and Dale Evans after school. I loved their outfits, the horses and the era. What a wonderful memory you brought back. I miss those days which was meaningful and my favorite show. My favorite show, too, Anne. Second was the Lone Ranger, followed by Rin Tin Tin. Those were great days! I was entranced with the show and wanted to be them. I did get a gift of a cowboy hat when my father travelled to Calgary. What a surprise that was. I never did have a beautiful costume such as theirs. My mother made up one and i did wear the skirt, bought the boots and had a shirt. Those were the days. You can’t beat a surprise cowboy hat! I bet you treasured it! And to have the skirt and boots, too–you were living the dream! This post resonated with me since I grew up during the 1950’s and envisioned my life in the west instead of the north where winter never ended and the grey skies predominated. Now I am in the West which is strange. I loved Dale Evans and Roy Rogers and watched Westerns so that I could travel back to those days. I grew up in north Idaho, which didn’t seem western enough to me. I never really knew where the west was, though. I guess I would have said Montana if asked. I gotta say, I love the north. I adore vintage images and print ads like this! Thanks for sharing your memories. Merry Christmas! You are welcome, Heidi. Merry Christmas to you! Wow look at those outfits! I was so excited when this catalog arrived. It really was my wish book. Did it show up early? I seem to remember that it came at a different time than the others. For years all we got was Sears and Montgomery Ward. My daughter and I still want everything cowgirl. This year, I bought her a Western shirt, a fiction book and bookmark where the heroine is a barrel racer, a barrel candle, two cowboy boots ornaments, and a horse puzzle. That is wonderful, Linda! They make so many cute western things now days, so it must be fun shopping. Thanks for the trip down memory lane. When we were kids we looked forward to the Sears and Wards Christmas catalogs. Our kids liked the Penney’s catalog best. We all marked our wish lists but didn’t really expect to receive more than one of the items marked,if that. It was indeed a wish book. You nailed it, Alice. It was truly a wish book. I recall liking Sears better than Montgomery Ward. JCPenney was a latecomer, but I liked it. Jeannie, I hope your dentist appointment went well. Most times it is not something to look forward to. I do remember having a cowgirl vest and skirt, yes back in the 50’s. My memory is very vague, but the vest was mostly beige with darker brown trim. It was over 60 years ago soma lucky I can remember even that much. Anyway, I was a big Western fan and watched every TV show set in the West. A big deal in our town was when Rin Tin Tin, the boy, and the Lieutenant came for some type of event. I hope you have a wonderful Christmas and a great 2019. How cool that you had a cowgirl outfit! And I’m jealous that Rin Tin Tin and company come to your town. When I was little I lived in a place called Talache that rhymed with Fort Apache. I thought that was so special! I never got a Cow Girl outfit but I had an Annie Oakley rifle that went with me everywhere. I put a snake down the barrel of it so I could sneak that lovely creature into the house. My mother did not find it amusing when he came out. I sure do miss that rifle. Oh my gosh, Rosie! That is a great story! You must have been quite the adventurer as a kid. Wow, those are hilariously amazing, Jeannie! 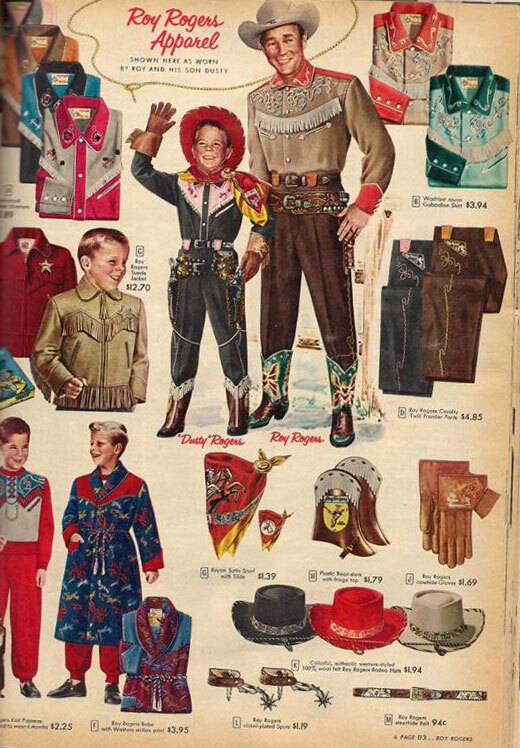 I don’t recall getting the catalog as a kid, but I can see totally wanting a cowgirl outfit! I’m sure I would have loved any of them, especially one with a twirly looking skirt! Can’t beat a twirly skirt, Fedora. To this day they are my favorite kind! Oh I love everything cowboy! I wear boots and jeans all the time now! Lol. That’s the best way to dress, Joy! I bet they are comfortable, too! There’s nothing like a good pair of boots. Love the swagger! those are adorable. We just had the holsters and fake guns and cap guns. And boots. Yes! Cap guns and boots were a big part of our lives, too. So much fun to bring in those bad guys. These vintage photos are so fun! Thank you for sharing! You are so welcome, Caryl! Thanks everyone for posting all these fun comments. You guys really had me smiling! Now to announce the winner of the gift card…It’s Caryl Kane! Please shoot me an email – jeanniewrites@gmail.com – and I’ll get that card to you. Congratulations and thank you everyone for stopping by! Thanks for the post on the Wish Books. I always went thru & checked what I wanted Santa to bring, hoping he liked to get some help from the Wish book. I, sometimes got what I checked. Loved those cowboy & cowgirl outfits, however; I liked the guns.